Bing Shopping has a feature that lets you earn cashback on certain items. Currently, this option is only open to people who have a valid mailing address in the US, and are over 18 years of age. In order to use Bing Cashback, you need to open a cashback account using your Windows Live ID or your email address. I used my Gmail id to open an account. It took about five minutes to open the account and add some additional information to it. Next you search for stuff on Bing, click on the result to buy from the store, login to your Bing cashback account, and do your shopping. Pretty much what youâ€™d normally do, except there is an extra step of logging in to your account. Not everything you buy through Bing will be eligible for cashback, and only search results that have the â€œBing Cashbackâ€ icon next to it are eligible. The interesting thing here is that the same thing may have a cashback at one store, but not at another. 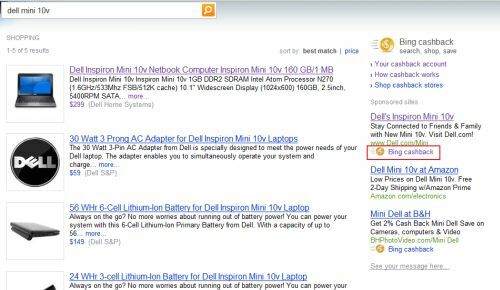 I searched for Dell Mini 10v, and saw that the organic search results didnâ€™t have the cashback option, but the sponsored results had Dellâ€™s website as the first result, and it had the Bing cashback icon on it. I clicked on the sponsored result, and it took me to a page which asked me to enter my Bing cashback email address. After logging on to the website, I could shop for the Dell Mini, and get 5% cashback (I didn’t actually make the purchase). What I am not sure is whether I will get cashback, if I buy something else from this website. The Bing FAQs say that as long as it is the same session, and the product is eligible for a cashback, I will get it. But I donâ€™t see a way to find out what is eligible once I am on Dellâ€™s website. If I change my mind and decide to buy something else, Iâ€™d much rather do that product search on Bing again, rather than guessing whether there is a cashback or not. Bing says that it may take up to 60 days for them to credit the cashback to you, and there is a minimum payout amount of 5 dollars before they can credit anything. There is a quick cashback option that lets you get the cashback immediately without having to wait the 60 day period. To take advantage of quick cashback, you must join that program, make the purchase from a participating store, and pay through PayPal. I didnâ€™t see many participating stores in the quick cashback program, so I donâ€™t think the quick cashback program is as effective as you may like. If you use coupons or other discounts, then you may not be eligible for cashback on that item. I think this is a useful program, and one that you can take advantage of, if there arenâ€™t any discounts or deals on stuff you are buying. Here is the link the Bing cashback FAQs, in case you are interested to learn more. If someone has used this service, please share your experience. I am sorry to hear your troubles. I hope they do respond soon and get it sorted out. I have used the big to purchase from ebay. I have confirmation from paypal that I have received the funds. It does work. Signed up yesterday – a little confusing – but managed to muddle through it all. Also signed up for the immediate cash back, since I already have a paypal account. So far, it looks like it’s working fine – both of my purchases were from Tiger Direct. There is quite a lot of confusion about exactly what your percentage cash back will be – google it – some people cannot repeat others percentages – i.e. one person says – I got 15% – other’s who try to duplicate it say “I can only get 8%. So I think it varies – and frequently. So far – it’s shows some great promise. Also evidently there was a problem with Firefox settings in mid-2009. I haven’t had that problem so far – that I know of.